John Paul Jones (6 July 1747 – 18 July 1792) was a Scottish American sailor and the United States' first well-known naval fighter in the American Revolutionary War. Although he made many friends and enemies among America's political elites, his actions in British waters during the Revolution earned him an international reputation which persists to this day. As such, he is sometimes referred to as the "Father of the American Navy" (an epithet he shares with John Barry). He later served in the Imperial Russian Navy, subsequently obtaining the rank of rear admiral. The political principles for which we are now contending they can never be practically applied or even admitted on board ship, out of port, or off soundings. This may seem a hardship, but it is nevertheless the simplest of truths. Whilst the ships sent forth by the Congress may and must fight for the principles of human rights and republican freedom, the ships themselves must be ruled and commanded at sea under a system of absolute despotism. ...the Bon Homme Richard, having head way, ran her bows into the stern of the Serapis. We had remained in this situation but a few minutes when we were again hailed by the Serapis, "Has your ship struck?" To which Captain Jones answered, "I have not yet begun to fight!" In Naval teminology to "strike the colours" means to haul down the ship's flag to signify surrender, but here the use of the ship as subject of the sentence may imply a pun on the non-naval use of "struck". His much less famous response, in the late phase of the Battle of Flamborough Head, 23 September 1779, to an inquiry by his opponent (Captain Richard Pearson of the Royal Navy ship HMS Serapis) as to whether he was surrendering his ship, the USS Bonhomme Richard, which was by this time very seriously damaged. This was what some of his sailors, reported in British newspapers at the time, claimed he had said; Jones's official report merely stated that he had answered "in the most determined negative". This statement was attributed to Jones in a 1900 biography by Augustus C. Buell which contains much material now believed to have been fabricated by Buell. Variant: That flag and I are twins. We were born at the same hour. We cannot be parted in life or death. So long as we float, we shall float together. The boy born at Arbigland in Scotland on 6 July 1747 and christened John, who later added Jones to his surname Paul, and who was generally known as Paul Jones during the height of his naval career, had a complex character and far from a simple career. Born in obscurity and poverty, he rose through his own efforts to be a distinguished naval officer and a prominent figure at the Court of Versailles. He professed to have fallen in love with America at first sight, and declared undying allegiance to the new nation; but the last five years of his life were spent in Europe. On many occasions he wrote that he had drawn his sword from pure love of liberty and as a "citizen of the world"; but he drew it for the last time in the service of the greatest despot in Europe, Imperial Catherine. He affected contempt for family and rank; but he longed to be accepted by the county families of Scotland, and his happiest years were spent in Paris under the shadow of royalty as le Chevalier Paul Jones. He professed to be indifferent to wealth; but no naval officer strove longer and more strenuously than he to exact the last penny due to him and his men for prize money. He could be tougher and rougher than the most apelike sailor on his ships; yet, when entertaining ladies on board or ashore, his manners were those of a very fastidious gentleman. He pretended total indifference to fame, but he took every possible means to place a far from modest estimate of himself before the public of two continents. And well did he succeed in this effort. Today, for every one who has heard of his fellow captains of the young Continental Navy, such as Manley, Wickes, Barry and Biddle, thousands have heard of John Paul Jones. Yet, first and always, Paul Jones was a fighting sailor. 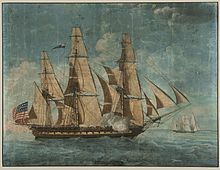 In the history of the United States Navy, whose rise to be the greatest navy in the world he desired and foretold, Paul Jones now occupies a place comparable only with that of Nelson in the Royal Navy of Great Britain. And, although he never had Nelson's opportunities for fame, I have no doubt that, given them, he would have proved himself to be a great naval tactician and strategist. In the board-to-board, hand-to-hand sea fights in which he did engage, he was without peer.